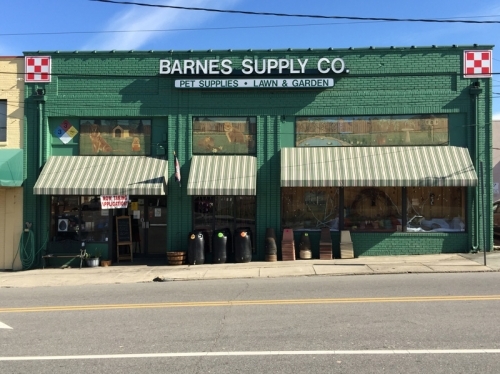 Barnes Supply Company first opened its doors in the 1950s. Decades later, it remains one of the city's oldest independently owned businesses. As we continue the proud tradition of providing for the agricultural needs of Durham's farming families, we have also evolved to meet the needs of our county's growing community of pet owners. We boast a wide selection of name brand holistic dog and cat foods, ranging from kibble and canned to freeze dried and frozen raw diets. Our high quality dog and cat treats are made locally or by the name brands our customers have come to know and trust. Our walls hold a handsome selection of collars, leashes, and durable dog toys as well as a great selection of supplements and topical treatments for pet health and skincare. Barnes still provides quality agricultural feed for horses, goats, llamas, emus and even mini pigs. Our cleverly decorated wild bird department is now located indoors. Behind the store, we have a small building dedicated entirely to chicken supplies. In our gardening department you’ll find a beautiful selection of bulk seeds that are still sold by the ounce, just like in the olden days! Also available are several reputable brands of organic fertilizers, soils, and insecticidal solutions. The inventory here at Barnes is uniquely shaped to suit the needs of the local community. Here in Durham, we love our pets, our urban gardening projects, and our backyard chickens. Barnes is staffed with kind and competent employees who are well versed in backyard adventures and kooky pet antics of their own. We love to see wagging tails in the store. We are conveniently located in the Ninth Street shopping district.